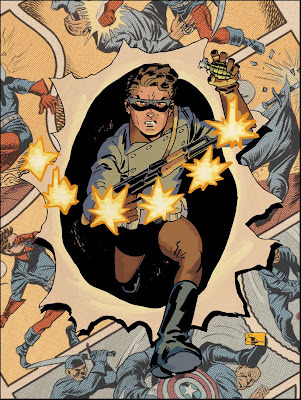 I should note that the background image is a Jack Kirby Captain America page that I cleaned up and colored, which you can see in it's entirety over at my blog. Great pick, Mitch! Doc, man, this is SO good! The use of the Kirby page as a design element is classic stuff. Well done, man! That's great. I love that he still looks like a kid sidekick. That's something I tried to do but wasn't very successful.